Top seed Roger Federer booked his place in the last 16 of the Australian Open with a straight sets victory over Albert Montanes. Roger Federer sets up a last-16 encounter with either Lleyton Hewitt at the Australian Open after a routine victory over Albert Montanes. 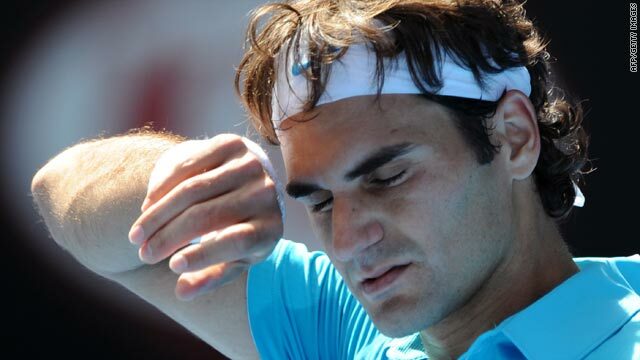 (CNN) -- Roger Federer booked his place in the last 16 of the Australian Open after a routine straight sets win over Spain's Albert Montanes on Saturday to set up a match with home favourite Lleyton Hewitt. The world number one was relatively untroubled as claimed a 6-3, 6-4, 6-4 victory over Montanes and felt his serve proved to be crucial factor in the victory. "I thought it was dominated from my side with my serve, which allowed me then to take chance on the return," Federer told the Australian Open Web site. "It was a pretty straightforward match, really. I don't remember him having any breakpoints. He was playing tough from the baseline and making it hard. I'm happy with the match and was able to serve it out, so it was good." Federer will now turn his attention to Australian Hewitt who led Marcos Baghdatis 6-0 4-2 before the Cypriot was forced to retire with a shoulder injury. Third seed Novak Djokovic thrashed Denis Istomin 6-1 6-1 6-2, while sixth seed Nikolay Davydenko claimed a 6-0 6-3 6-4 victory over Juan Monaco. It was a pretty straightforward match. Davydenko's fourth-round opponent will be Spaniard Fernando Verdasco, who advanced when Stefan Koubek of Austria retired due to sickness after losing the first set 6-1. France's Jo-Wilfried Tsonga, who was a beaten finalist in 2008, came from a break down in the fourth set to beat Tommy Haas 6-4 3-6 6-1 7-5. Defending champion Rafael Nadal battled through into the last 16 after being taken to four sets, while fellow title hopefuls Juan Martin Del Potro, Andy Murray and Andy Roddick also progressed. World number two Nadal progressed after beating German 27th seed Philipp Kohlschreiber 6-4 6-2 2-6 7-5 in three hours and 39 minutes. The Spaniard will play Ivo Karlovic in the fourth round after the big-serving Croatian defeated 24th-seeded compatriot Ivan Ljubicic 6-3 3-6 6-3 7-6 (9-7). Kohlschreiber had eliminated two other left-handers in his opening matches, and fought back to stun an out-of-sorts Nadal by winning the third set. He fought back from a break down to level at 4-4, but paid the price for three wild forehands on his own serve at 5-5 and Nadal duly closed out the match. Fifth seed Murray had no such problems as he cruised past Frenchman Florent Serrain with a 7-5 6-1 6-4 victory, and has yet to drop a set in three matches so far. The 22-year-old Briton will next play American 33rd seed John Isner, with Nadal waiting for him in the quarterfinals if they both win their fourth-round ties. But he faces a challenge against the big-serving Isner, who knocked out French 12th seed Gael Monfils 6-1 4-6 7-6 (7-4) 7-6 (7-5) and is the second tallest player on tour. Murray said: "I have broken serve a lot so far this tournament against guys that have good serves. Kevin Anderson is a good server. I returned well against him. I'm going to need that in the next match. "Isner is playing really well. He won the tournament in Auckland last week. The guy is 6ft 9in and he has if not the best serve on the tour... I'll have to return well again." Fourth seed Del Potro was also taken to four sets as he defeated Germany's Florian Mayer 6-3 0-6 6-4 7-5. The U.S. Open champion will face 14th seed Marin Cilic in the fourth round after the Croatian defeated Swiss 19th seed Stanislas Wawrinka 4-6 6-4 6-3 6-3. If Argentina's Del Potro wins that match, he will play either seventh seed Andy Roddick or 11th seed Fernando Gonzalez in the quarterfinals. Roddick, the 2007 losing finalist, advanced after being tested by Spain's Feliciano Lopez before he finally won 6-7 (4-7) 6-4 6-4 7-6 (7-3) in three hours and 32 minutes. Both men recorded 29 aces, but Lopez suffered through 60 unforced errors, while American Roddick had 21. Roddick said: "I felt like I was real close to getting on top of the match and making it, turning it, to kind of make it a little bit more comfortable. Just didn't quite get there." Gonzalez was also on court for more than three hours as he edged out Kazakhstan's Evgeny Korolev 6-7 (7-5) 6-3 1-6 6-3 6-4.